Suzuki SX4 Review: Suzuki is not a major player in the car market here in North America, but they would like to be. First known for their motorcycles, then their small, frugal and rugged SUVs, Suzuki has yet to cement an identity as a builder of passenger cars. That does not mean you should not put them on your list of possibilities. 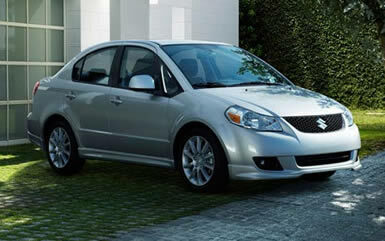 The 2009 SX4 Sedan is a fine, compact, four-door sedan. It is taller than many of its competitors with an astounding 3+ feet of headroom, front and rear. The seats are situated high enough that you do not feel like you are sitting down into them. Although rated as a five-passenger vehicle, like many in its class, four people will fit more comfortably. Overall I do not find the styling of the SX4 as appealing as some of its competitors but styling is a subjective issue, but I did find the quality to be above average. Everything had a substantial feel to it. Even though the SX4 is tall and somewhat boxy it did not get blown around on the road like some small cars do. Under the hood is a transverse DOHC four-cylinder engine that produces 143 hp, which is ample for a vehicle that weighs in the neighborhood of 2,700 lbs. The engine may be coupled with either a 5-speed manual transmission or a 4-speed automatic. The vehicle I drove had the automatic. It performed perfectly as expected. The SX4 Sedans are all front-wheel-drive only. I drove a Suzuki SX4 Sport with the Technology Package, a nicely equipped vehicle. The SX4 starts as the Sedan and each additional package adds equipment. There is the base Sedan, the Sedan LE, LE with popular package, Sport, Sport w/Tech, and Sport Touring. You get a navigation system with real time traffic alerts, Bluetooth, fog lights, leather wrapped steering wheel with integrated audio controls, and cruise control in addition to everything that is included on lesser models. Suzuki has taken a very sensible approach in adding a navigation system; instead of building in a unit specific to the SX4, a standalone unit, similar to what you can buy in many stores, is installed. It fits nicely into a little cubby with a popup lid in the center of the dash where the radio speaker used to be in olden days (remember them, sonny?). There is one thing I wish Suzuki, and every carmaker, would adopt as standard equipment though, express up and down driver�s side door window. Suzuki�s is express down, not up. If a window can only have express one-way, please make it up. When I roll into a toll booth I have enough time to roll down the window, but when I drive out, often trying to hold onto the change and receipt, maybe shifting gears and merging back into traffic, I almost need a third hand to bring the window back up. It�s tiresome in good weather, downright ridiculous in bad weather. There is absolutely no reason any vehicle that has power windows should not have express up and down. Even though fuel prices have come down since their astronomic heights of a few months ago, I still appreciate frugal cars. But seeing as I drive about 400 to 500 miles per week, I like my creature comforts too. A good seating position, one that does not tire me out after a half hour, is a prerequisite. I have got to have an excellent climate control system; I do not like to wait forever for the windshield to defog and I hate chilly toes. A vehicle should have a good sound system; it does not have to be super powerful but it should pull in any station within a reasonable distance, be able to be heard over the road noise, and be easy to operate. Add in cruise control and I�m a happy guy. The Suzuki SX4 Sport had all of that, and it�s still frugal. How frugal was it? The Sport is rated at 22-city and 30-highway with the auto trans, not great, but good enough. The manual transmission, which would be my choice, is rated 1-mpg less on the highway. The big question for many people is, is the price competitive? That is a definite YES. The base SX4 Sedan starts at $13,299, the SX4 Sport Touring goes up over $20,000 if optioned to the max. Suzuki offers what they say is �America's # 1 Warranty: Fully transferable, 7-year 100,000 Mile Powertrain Warranty including Roadside Assistance and Courtesy Vehicle Program.� I think that�s Suzuki�s way of saying they�d like to be your car company.